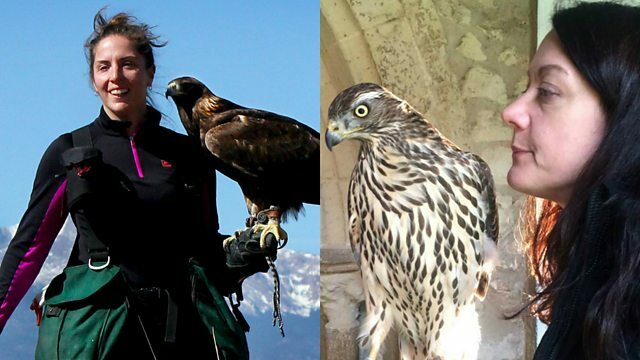 Two women who train hawks, falcons and eagles talk about the extraordinary relationship they form with their birds, and what they have learnt about themselves in the process. The ancient art of falconry holds a magical appeal for our guests this week. They talk to Kim Chakanetsa about why they were drawn to this ancient tradition, the unique relationship they form with their birds, and the concerns of those who consider it cruel. Helen Macdonald from the UK is the bestselling author of H is for Hawk, a moving account of the year she spent training Mabel the goshawk after her father's death. As a child Helen was obsessed by birds of prey and was determined to become a falconer - later she used her writing to bring the powerful relationship between humans, falcons and nature to a wider public. She's not currently working with a bird, but she dreams of flying merlin falcons. Lauren McGough from Oklahoma in the US has become a world authority on the golden eagle - though growing up she didn't know falconry existed. She discovered the sport at the age of 14 and has been hooked ever since, travelling to Mongolia to learn more about eagle falconry from nomadic eagle hunters. She's currently based in South Africa, where she's working with a male crowned eagle called Dart.